In the European Roulette game the player can bet on a single number, a color, a group of numbers or on odds or even numbers. The winnings are determined by the slot on the roulette wheel where the ball finally stops. The amount of the payoff depends on how the bet was placed. Playing the European Roulette game is very simple. The table is identical to those of other casinos. Our European Roulette table is marked with the numbers "0" and "1-36" (without "00"). On the wheel, the numbers are alternately colored red and black, with "0" colored green. The player begins by clicking and dragging chips to the desired areas on the table. The wheel is spun by clicking on the "Spin" button. When the ball finally stops on a number, winnings are automatically added to the game’s bankroll. 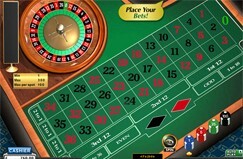 By selecting the “Repeat” button, the player will repeat the previous bet with the same chip positions on the table. Similarly, pressing RepeatX2 doubles the value of the bet while maintaining the same chip positions on the table. Line Bet: Place your bet at the end of two streets on the line dividing them. A line bet covers all the numbers in either street, for a total of six. Dozen Bet:Place a bet in one of the boxes marked "1st12", "2nd12", or "3rd12", each of which covers twelve numbers. Low/High Bet: A bet placed in one of the boxes marked "1 to 18" or "19 to 36", covers 18 numbers. Four Number Bet:A bet placed at the corner of the intersection of 0 and 3, covering the numbers 0, 1, 2, and 3.